A new study that just came out has named Trader Joe’s America’s favorite supermarket. It’s followed closely by Whole Foods and Publix, but Trader Joe’s rose above because of higher votes in cleanliness and atmosphere. In honor if this grand title (and because of how much we too love Trader Joe’s) we want let you in on which of their frozen meals to skip over, and which meals to hop, skip, and jump to! Trader Joe’s Black Bean & Corn Enchilada- Made with organic white corn tortillas, corn, and black beans. Upside: Vegan, very low price, only 260 calories for the package, and great flavor. Plus 20% of your iron needs for the day! Downside: Small portion may not be enough for lunch- add a piece of fruit! 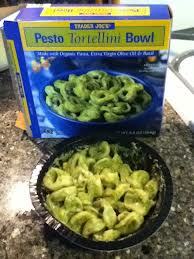 Trader Joe’s Pesto Tortellini Bowl- Made with organic pasta, extra virgin olive oil, and basil. Upside: Good taste for pasta and pesto sauce lovers. Good amount of protein with 18 grams and 10% iron. Downside: Very high in calories and 40% of daily recommendation for saturated fat. Zero vegetables. Sodium at 26% of daily recommendation. Trader Joe’s Thai Vegetable Kao Soi- A vegetarian broth flavored with coconut and mild curry, Trader Joe’s is more like a stew than soup, featuring hearty chunks of vegetables and copious amounts of noodles, along with a packet of crispy noodles you add just before serving. Upside: Vegetarian, very low price, authentic Thai dish. Includes 6 grams of fiber, and meets 50% daily recommendation for Vitamin A and 20% for iron. Downside: Calories slightly on the higher end, very high saturated fat with 70% of the daily value, and sodium at 27% of daily recommendation. Crispy noodles don’t taste very good. Upside: Great flavor and good taste! Low price too. Great source of fiber with 8 grams and 20 grams of protein. Downside: Meal does not look as appetizing as the photo on the box. Sauce gets a bit dry after heating up, but all in all still good! Congrats to Trader Joe’s, Whole Foods, and Publix for ranking so highly- we are big fans of all three. To see a synopsis of the report and how other supermarkets fared you can go here.